Rehearsing short, funny skits using a prepared script can help you develop your comedic timing and wit, whether you want to be a professional actor or are just working on comedic skits as a hobby. However, finding material that’s appropriate and won’t take a great deal of time to learn can be difficult, especially if you need a script for a small or very large group. Depending on your situation and location, there are a variety of different ways to find short comedic pieces that you will enjoy rehearsing, whether you’re doing it alone or with a group. Ask your school’s drama teacher or the instructor of private drama classes whether they can provide a copy of a short, funny skit that you can work on in or outside of class. Most drama teachers have a wide variety of source material to pull from that you may simply not know to look for. If your teacher doesn’t have anything for you, he or she may be able to direct you to an appropriate resource. Check your local library’s drama department. Most libraries house scripts for dramatic pieces, plays and performances of all types, including short comedy pieces. While most libraries will have some material that you can use, you’ll likely have more options at your city’s central or main branch. You can often check out multiple copies of a script for the other players. Purchase a large sourcebook like “The Ultimate Scene and Monologue Sourcebook: An Actor's Guide to over 1,000 Monologues and Dialogues from More than 300 Contemporary Plays” by Ed Hooks, or “Scenes for Young Actors” by Lorraine Cohen and Stephen P. Cohen. Such books can be ordered online from various retailers or through a local bookstore. Visit a local bookstore that specializes in theater production and play scripts. Most cities that have live theaters also have at least one bookstore that specializes in theatrical material. If you don’t have a specialized bookstore in your town, find a bookstore that sells play scripts. Use the FreePlays.org website database to find short comedy scripts that can be performed in small theaters, schools and community-based venues royalty-free. FreePlays.org specializes in material for children. The site also provides basic information about the length of the script and how many players are needed to perform it, which is particularly helpful when you’re looking for a short comedy skit for a group. Consider transcribing a skit that you like and want to use for rehearsal from a video or television show. A short sketch won’t take long to copy, especially if it’s just for one or two characters. If you can’t find a bookstore in your area that sells theatrical material, look for an online store that sells plays and comedic scripts. You may be able to browse sample content on the website to see if the material is what you're looking for. Using short skit scripts or transcribing your own is legal for rehearsal purposes. However, if you’re going to perform the skit for an audience, you’ll need to clear it with the publisher or author unless it is a royalty-free skit script. 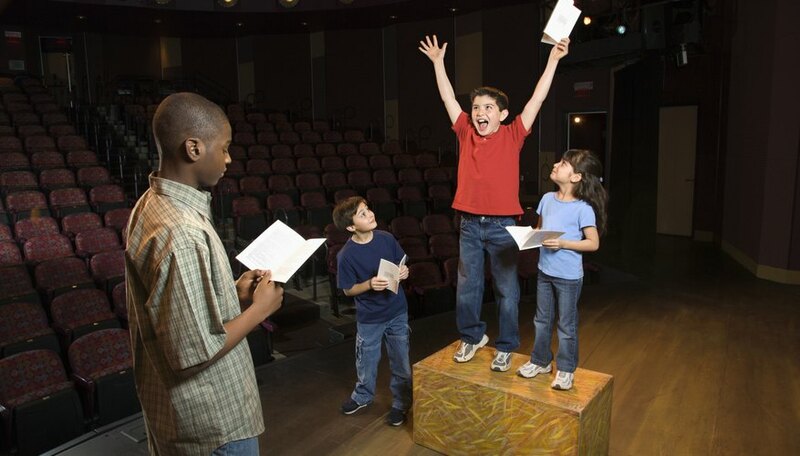 Many publishers allow material to be performed for school plays and education purposes for little or no money.